We are proud to have the latest state-of-the-art vision computers while experiencing the "old fashioned way" of treating our patients like family. These vision computers help take the guess-work out of "which looks clearer" when going through a thorough eye examination. We look forward to the opportunity to serving your family's optometric needs. 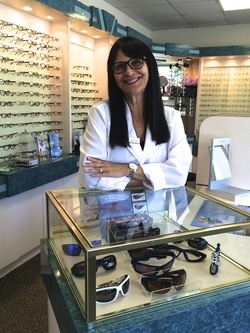 Dr. Laraine Viviani is a graduate of Loyola College in Maryland and The New England College of Optometry. She joined her father, Dr. John Viviani, 28 years ago. She is a member of the American Optometric Association, the Suffolk Optometric Society, and an affiliate of the The Laser Center of New York. Dr. Laraine Viviani specializes in diagnosing and treating ocular diseases, custom fitting contact lenses and comprehensive eye and vision exams. John J. Viviani, Jr, O.D. Dr. John Viviani, Jr. graduated Columbia School of Optometry. He was the first Optometrist to examine the first patient in the original Optometric Center of NY. Besides being active in his Optometric practice, he is a past president of the Suffolk Optometric Society and the Kiwanis Club of South Huntington. He is also a member of the New York Academy of Optometry. Dr. John Viviani is a pioneer in the fitting of specialized contact lenses and vision training. Valerie is responsible for the preliminary measurements taken prior to the doctor's eye examination. She is very skilled in the use of our vision computers which takes the guesswork out of "which looks clearer". She uses visual skills to determine the patient's depth perception, color vision and other vision problems associated with reading. Jo is our Frame Stylist who has over 30 years experience in the optical field. With her education in the arts, Jo has a flare to pick the perfect frame and lens designs for all your optical needs. With our wide variety of up-to- date designer frames to choose from, Jo enjoys spending time helping patients pick the frame that suits their style and needs. 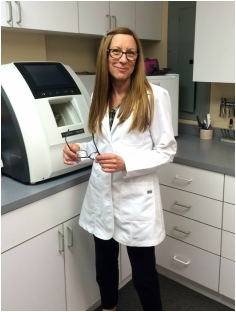 ﻿Susan is our licensed dispensing optician with over 30 years experience in the fabrication of eyeglasses. She uses the newest state-of-the-art optical lab equipment. Susan has extensive knowledge in all lens types, coatings, fit and fashion of eyewear that is best suited for your individual needs. Diane is our administrative assistant who has been a loyal and dedicated part of our team for 15 years. She is extremely helpful in assisting patients with their various insurances and vision plans. Diane is very dedicated to serving our patients with a smile. She prides herself in running the office efficiently and smoothly.